The Utah Jazz and Sacramento Kings once had arguably the most heated rivalry in the West – two teams with passionate fan-bases, contrasting styles, and emotional personalities that seemed to gravitate toward each other in the postseason at the turn of the century. The rivalry began in the 1998-99 lockout-shortened season, in which all three regular season meetings went to overtime and seemed to contain some sort of altercation (such as their 4/13/99 meeting which featured a Greg Ostertag ejection and numerous technical fouls). The Jazz finished that season with the NBA’s best record at 37-13 but tie-breakers pushed them down to the #3-seed and a matchup with the Sacramento Kings who were in their first year of the Vlade Divac/Chris Webber-era. After the Jazz opened the series with a 117-87 rout, the Kings stole Game 2 in SLC that involved the infamous Webber cheapshot on Stockton that would hamper the 37-year old point guard throughout the postseason, as well as a Bryon Russell sprained ankle. Game 3 went to overtime, where Jazz center Todd Fuller missed 2 FT’s with 4.2 seconds left and Utah trailing by 1 to push the Jazz to the brink of elimination. With Sacramento leading 2-1 in the best-of-5, Arco Arena was a madhouse for Game 4 as the raucous cowbell-ringing Kings fans could sense imminent victory over the aging and exhausted Utah Jazz. Game 4 was a back-and-forth affair with each team responding to the other team’s mini-runs. In the 4th-Qtr, Sacramento appeared to deal a dagger when Vernon Maxwell’s three put the Kings ahead 81-76 with 2-minutes remaining – setting the stage for one of the most dramatic finishes in Jazz postseason history. 1:48 4th-Qtr – Chris Webber 1-2 FT’s posting up Russell; 82-78 Kings. 1:30 4th-Qtr – Shandon Anderson left-corner three; 82-81 Kings. 1:16 4th-Qtr – Vlade Divac 2-2 FT’s posting up Malone; 84-81 Kings. 0:57 4th-Qtr – Anderson left-corner three; 84-84. 0:31 4th-Qtr – Anderson transition layup off feed from Stockton; 86-84 Kings. 0:23 4th-Qtr – Divac three-point play posting up Malone and fouled by Stockton; 87-86 Kings. 0:13 4th-Qtr – Malone layup off high screen-roll with Stockton; 88-87 Jazz. 0:07 4th-Qtr – Divac 2-2 FT’s posting up Ostertag; 89-88 Kings. 0:00.7 4th-Qtr – Stockton 22-footer off high screen-roll with Malone; 90-89 Jazz. Final Score: Jazz 90, Kings 89. In the final 2-minutes, the Jazz were perfect offensively going 6-6 for 14 points, with Stockton’s game-winner the capper. After “The Shot” in Houston, this was arguably the second-most memorable basket in Stockton’s illustrious Hall-of-Fame career. Utah’s road victory was also a perfect example to expose the myth that Jerry Sloan always closed out games with his starters. In Game 4 Sloan did not play Jeff Hornacek a single second in the 4th-quarter. Not only was the 36-year old sharp-shooter showing fatigue, he was also struggling against Sacramento’s more athletic wings who were either beating him with quickness (Jon Barry/Vernon Maxwell) or in the post (Tariq Abdul-Wahad). As a result, Sloan closed the game with a crunchtime lineup of: John Stockton, Howard Eisley, Shandon Anderson, Bryon Russell, and Karl Malone. Despite the size discrepancy between Malone/Divac and Rusell/Chris Webber – Utah’s small lineup was effective as the 6-7 Russell fronted the 6-10 Webber in the post and Utah’s four three-point shooters caused Sacramento’s slower frontcourt problems – with Shandon Anderson springing free for two corner-threes before beating the Kings in transition. 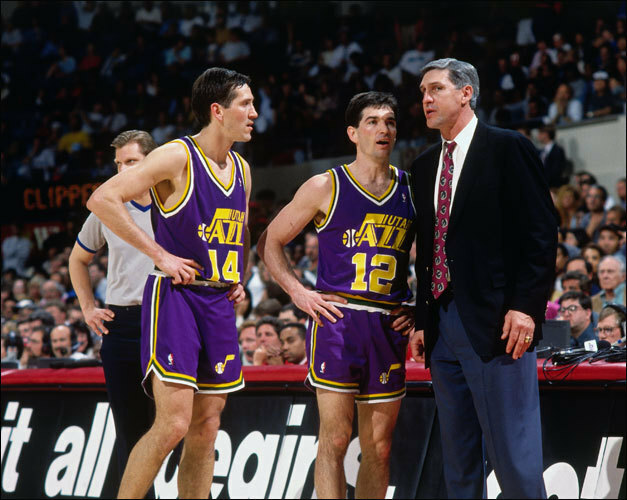 In Game 5 two days later, Sloan again had enough of his ineffective centers and – with Utah trailing late in regulation – went back to his small lineup in crunchtime – this time including Hornacek (18 pts) along with Stockton, Anderson, Russell and Malone. Once again, the small lineup created problems as Russell was left alone in the corner for the game-tying three with 48-seconds left in regulation to send the game to overtime. In the extra session, the Kings couldn’t matchup with Shandon Anderson’s quickness and hard-cutting as the 3rd-year guard again shook loose with 6 of his 16 points in OT. In Game 2, Sloan had tried to close the game with Ostertag (who had a playoff career-high 16 points in Game 1) and got nothing. He went with Fuller in Game 3 and was burned. After trying Thurl Bailey early in the 4th-Qtr of Game 4 with less than stellar results – he simply went with his 5 best players to close both Games 4 and 5 – and that move (along with their tenacity and grit) won him the series over a talented Kings team that was on the rise to a Western Conference power. The rivalry remained intense and heated when the teams met in the postseason two years later. Two dramatic victories in Games 1 and 3 boosted Sacramento to a grinding 3-1 series victory as the top-seeded Kings would eventually advance to Game 7 of the conference finals. Their 2002-03 regular season meetings involved the Utah fans showering the referees with water bottles as they left the court following a controversial ending and with Sloan shoving referee Courtney Kirkland to earn a 7-game suspension. Their ensuing 2003 playoff series became most noted as Stockton and Malone’s swan song. The Kings would win the series 4-1, and as Stockton and Malone exited the game together for the final time – the classy Sacramento fans gave the duo a rousing standing ovation. In the 9 seasons since, neither team has qualified for the playoffs in the same season with 5 Jazz posteason appearances and 3 by Sacramento. As the players and coaches moved on – the rivalry has faded but for 4 seasons, it was as intense as there was in the Western Conference. It treated us to emotional fireworks, raucous crowds and dramatic finishes – none more memorable than Stockton’s game-winner. On January 27, 2001, the NBA on NBC made it’s way to Salt Lake City for a nationally televised Saturday afternoon clash between the 27-14 Utah Jazz and the 25-15 San Antonio Spurs. The Spurs won convincingly 99-86 but the most memorable play of the game never showed up in the boxscore. In the waning seconds of the first-half, Jazz reserve John Crotty poked the ball away from the Spurs’ Terry Porter as Porter was advancing the ball to call timeout. That sort of thing has happened hundreds if not thousands of times over the years, but on this day the basketball chose to take a painful trajectory to the midsection of Spurs coach Gregg Popovich (much to the humor of NBC analyst Doug Collins). In typical Pop-style, he was eventually able to walk it off and later joke wryly about it with Jim Gray, saying “It was a very accurate body-shot, I went down like a hockey goalie.” In all the years of watching basketball on many different levels, I can’t say I’ve ever seen a play like this. In Gregg Popovich’s 17 seasons as head coach of the Spurs, San Antonio has enjoyed tremendous success over the Utah Jazz. In Pop’s first two seasons at the helm, the Spurs lost 3 of the 4 regular season meetings to the Jazz while also being eliminated in their 5-game ’98 Conference Semifinal series as Utah was on its way to two consecutive NBA Finals berths. In the 15 seasons since, San Antonio has won the season series over Utah 10 times, splitting 4 others and losing just once (0-4 in 2009-10). The teams have met twice more in the postseason, with the Spurs defeating the Jazz 4-1 in the 2007 Western Conference Finals and convincingly sweeping them 4-0 in the First-Round of the 2012 playoffs. At one point, the Spurs even held an 18-game winning streak over the Jazz before Mehmet Okur started his own personal streak over San Antonio – making three game-winning shots in home games against the Spurs between 2005 and 2007. While Jazz Hall-of-Famer Jerry Sloan posted only a 37% career winning percentage against Popovich, Utah under Ty Corbin have struggled even worse – winning just 17% of their meetings (2-10 record). One of Corbin’s wins was a thrilling 99-96 victory on a Mo Williams buzzer-beater, while the other was a hard-fought 91-84 asterisk win in a game Popovich opted to leave his three best players at home. With 4 NBA Titles and a 68.3 winning percentage, Popovich is a sure-fire Hall-of-Famer and one of the greatest coaches in NBA history. The half-court offense, team-defense, and player development success he has built in San Antonio have made the Spurs a model franchise for other NBA teams. Interestingly Popovich has said he looked to pattern much of the Spurs’ culture after some of the primary characteristics that Jerry Sloan, John Stockton and Karl Malone possessed in making the Utah Jazz one of the league’s most successful teams from the late 80’s through 2010. During an interview that aired during the pregame of that painful 1/27/01 game, Popovich paid Stockton, Malone and Sloan the ultimate compliment. Over 12 years later, it’s the Spurs organization that is head and shoulders above at least 85% of the league, and that is largely due to Gregg Popovich. His record speaks for itself. He’s a proven champion and consistent winner while quietly becoming one of the league’s most compelling personalities. And he has also shown he can take a hit. On January 26, 2007 the Utah Jazz and the Denver Nuggets traded bullets in a wild back-and-forth shootout that went down to the final minute – with the Jazz prevailing 116-111. True enough, Utah’s 116-111 victory had a little bit of everything. The Nuggets’ superstar duo of Allen Iverson (33 points) and Carmelo Anthony (37 points) came out on fire leading Denver to a 67-62 first-half lead. The Jazz stayed within striking distance but a sprained ankle late in the first-half would sideline Jazz starter Andrei Kirilenko for the remainder of the game. With a slew of minutes available and the Nuggets in control, in stepped 21-year old rookie Ronnie Brewer (12 points). Trailing 82-71 with 4-minutes remaining in the 3rd-qtr, the Jazz strung together a run where Brewer followed a Carlos Boozer 3pt-play with back-to-back layups to bring the Jazz within 4 and force the Nuggets to call for time. Brewer’s hustle and athleticism re-energized a capacity crowd at Energy Solutions Arena and the game would be a see-saw affair the rest of the way. A slew of wild plays gave the Nuggets a 1-point lead with 45-seconds left, but twice in the final 2-minutes Carlos Boozer regained the lead for the Jazz with his 2 FT’s putting Utah ahead for good 112-111 with 31.9 seconds remaining. Boozer finished with 25 points and 19 rebounds, Deron Williams added 16 points and 12 assists, Mehmet Okur scored 14 and the Jazz also received a whopping 46 points off the bench (including 13 by Gordon Giricek, 12 by Brewer and 11 by Matt Harpring). Now that’s what a real Jazz crowd sounded like. The Nuggets were steadily gaining momentum in the 3rd-qtr when Carmelo Anthony completely flubbed a wide-open layup in transition, much to the crowd’s delight. There are few things Jazz fans enjoy more than taunting Melo, and that really brought them back into the game. Kevin O’Connor, who was often deeply involved in games, was really fired up in the 2nd-half. If you watch him after Denver timeouts at 82-78 3:09 3rd-Qtr and 91-87 0:00 3rd-Qtr – he’s out of his seat enthusiastically fist-pumping. Jerry Sloan closed the game with a “big lineup” where rookie Paul Millsap played up front along with Boozer and Okur. The backcourt featured Deron Williams at point and either Brewer or Matt Harpring at SG. This game was a reminder that Carlos Boozer was really good offensively. 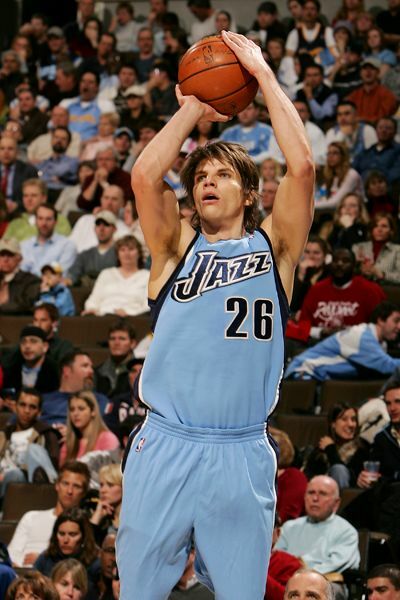 In 2006-07 he was one of the 8 best players in the NBA and even with the emergence of Deron Williams, Booze was still the leader on a Jazz team that would advance to the Conference Finals. Boozer was a beast on the boards – and on the foul resulting in his game-winning FT’s Nene tried to bear-hug him to keep him off the glass. Few things are more enjoyable about Jazzbasketball than beating Denver while listening to longtime Nuggets broadcaster Scott Hasitngs whine about it. Utah’s win was the 5th of a 6-game winning streak they would build over the Nuggets spanning from 2005-07. The Jazz would take 3 of the 4 games in 2007-08 and in 2010 upset 4th-seeded Denver in a 6-game playoff series despite missing Kirilenko and Okur to injury. The Nuggets averaged 51 wins between 2006-10 but the Jazz routinely caused them problems – taking advantage of Denver’s porous defense with superior offensive efficiency and scoring punch that often out-executed Denver’s own high-powered offense that was more free-wheeling and isolation oriented. Nearly all Jazz/Nuggets games in those years were high-scoring, exciting and emotional – and this was one of the best. Tonight’s Nuggets/Jazz game figures to be anything but a classic, but still important for a Jazz team on the brink of losing their season. After 3 wire-to-wire blowout losses in their last 4 games, the Jazz need to make this somewhat of a competitive game. Another listless start (on national TV no less) and things could get ugly very quickly in a division rivalry that once treated us to a thrilling style of basketball. 10 seasons ago, the Utah Jazz visited the United Center and defeated the Chicago Bulls 92-80 behind stifling defense, an efficient half-court offense, and the brilliant all-around play of 3rd-year forward Andrei Kirilenko. Playing on a back-to-back as well as the final game of a marathon 6-game in 9-nights roadtrip, the 14-13 Jazz came out and pounced on the 7-18 Bulls early – outscoring them 27-14 in the 1st-quarter and 52-35 in the 1st-half before cruising in the final 24-minutes. The 22-year old Kirilenko scored a game-high 26 points to go with 16 rebounds, 3 assists, 2 blocks and 1 steal in 37-minutes of play. AK shot 9-13 from the field, 6-6 from the FT line and 2-3 from behind the arc. Following an empty offseason that began with the departures of John Stockton and Karl Malone, virtually all the experts were lining up to pick the Utah Jazz as the worst team in the league. Fortunately for Utah, the Jazz still had longtime coaches Jerry Sloan and Phil Johnson to head up a staff that also included Gordon Chiesa and Kenny Natt. Together, in the foursome’s 8th NBA season together as a coaching staff, they worked near-basketball miracles taking a cast comprised largely of no-name players and shocking the NBA by winning 42-games and finishing just 1-win shy of making the playoffs. Despite playing only twice a season, the Utah Jazz have played many memorable road games against the Brooklyn (formerly New Jersey) Nets over the years. There was Andrei Kirilenko’s buzzer-beating tip in 2003. There was a 122-115 Jazz shootout in 1998 after which the Jazz were quickly ushered out of the arena following an anonymous death threat against Karl Malone. And of course there was Utah’s 103-92 road victory in 2008 that included a Jerry Sloan ejection – all of which took a backseat to the Carlos Boozer “I’m going to get a raise regardless” postgame quote. No Jazz/Nets season series was more contentious than 2001-02. On November 21, 2001 – former Ute Keith Van Horn’s -game-winner gave the Nets a 91-90 overtime victory in a game that featured an on-court confrontation between Karl Malone and Nets head coach Byron Scott. When the two teams met one month later on December 22nd, all eyes were glued to Malone and Scott who had since engaged in a war of words in the media. The Nets were 16-9 and on the way to their first NBA Finals appearance since the merger. The Jazz were playing the second game of a back-to-back and the 5th game in a 5-game/8-day roadtrip. This time, Karl Malone and the Jazz had the last laugh winning going away 104-90. The 38-year old Malone dominated, scoring 25 of his game-high 31 points in the 2nd-half. At 39, Hall-of-Fame running mate John Stockton was equally brilliant with 15 points (on 6-9 shooting) and 10 assists. 4 Jazz starters scored in double-figures and the Utah bench combined for 34 points – sparked by Russian rookie Andrei Kirilenko. The 20-year old Kirilenko scored 14 points and notched 4 steals and 3 rebounds while his energy sparked Utah to a 31-18 2nd-quarter advantage. After the Nets pulled to within 5 early in the 4th-quarter behind Keith Van Horn’s game-high 24 points, Malone went on a tear scoring 15 of Utah’s 27 4th-quarter points. While Malone and Byron Scott kept their distance, there were still fireworks in the final minutes of the game. On a fastbreak, Kenyon Martin essentially took a leaping close-fisted swing at Malone’s head while the Mailman was air-born going to the rim. Malone landed hard and Jerry Sloan raced off the bench ready to make Byron Scott’s November incident look like child’s play. Martin would be ejected for a flagarant-2 while Malone further demonstrated his indestructibleness, getting up to shoot the free throws before finishing the game by scoring 4 more points in the final minute. Following the game, the Jazz weren’t shy about voicing their displeasure of Martin’s play – which also included a similar foul when Martin violently striked Donyell Marshall in the head from behind in the 2nd-quarter. “Our team has been considered a dirty team for a long time – and I don’t recall anybody going in a situation like that,” added Jerry Sloan. Nets rookie Richard Jefferson offered up the most laughable defense, saying “It was a hard foul that Kenyon put on him [but] I think there was a lot of acting. If you look at [the Jazz] they set hard screens and they want to flop every time you hit them. Karl Malone should be the last person to ever complain about a hard foul.” Strong words coming from someone who went scoreless in 15-minutes of play while shooting 0-2 and posting a +/- of -20. Ultimately, Kenyon Martin was suspended for one game and fined $50k – on which then Nets president (and former NBA vice president) Rod Thorn embarrassingly complained, saying he felt the punishment was too harsh. Nearly a dozen years later, we know the answers. Kenyon Martin has carved out a journeyman career as a thug who could could do little more than emphatically dunk a basketball and the NBA has heightened its punishment and enforcement to the point players nowadays don’t even come close to committing hard fouls resembling as bush-league as K-Mart’s. Tonight the familiar faces of Jason Kidd, Richard Jefferson and Kirilenko will again be involved in a Jazz/Nets game. He may be a Net now, but Andrei Kirilenko will never feel like the opponent. And if that makes me a bad Jazz fan, please allow me to come and say I’m sorry, instead of coming and saying…well you know.